Today, I made a birthday card for my friend's son. He will be turning 1! I first made my background with Izink and Irresistible inks. I mixed my turquoise ink with water and sprayed it. I added a washi tape border and a black line. The 1 is a green sticker on circles cut with Spellbinders dies. The stamps were colored with Spectrum Noir markers and mounted on 2D foam. I added some Stickles on their gifts, hats and balloons for more sparkle. My sentiment was embossed in white on a black die cut. What a fun birthday card! Those are some happy dinosaurs. Thanks for playing along with us at Seize the Birthday! This card is absolutely charming! I love the way you created a whole entire scene with the dinosaurs looking so happy to be partying! This card made me smile and I really like the background techniques you used, too. I think the ink spraying pairs beautifully with the crisp and clean-looking dino images. 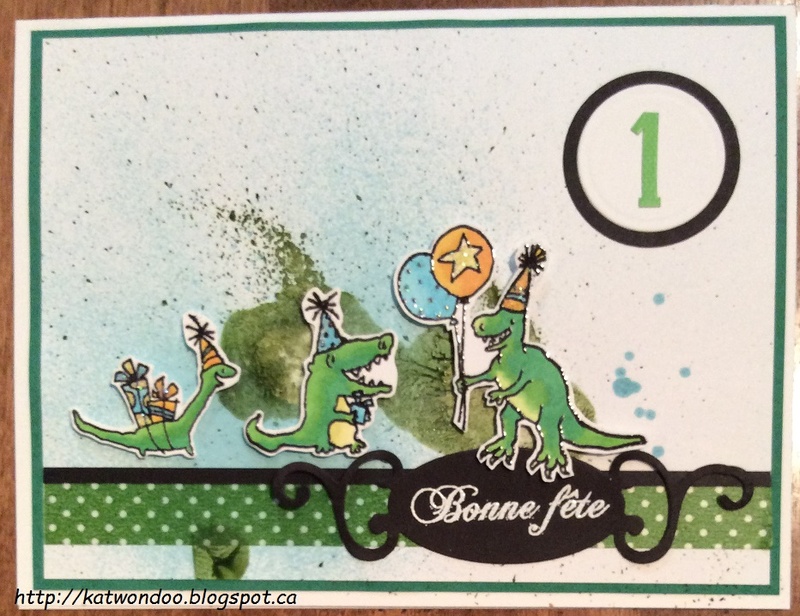 Great work here and I'm so glad you shared it with us for this week's Simon Says Stamp Monday Challenge! A very pretty card - the image is gorgeous. Love the layout. Thanks for joining in with Simon Says Stamp Wednesday Challenge this week.